I got the time to visit the photography streets west of the Taipei Main MRT train station. I didn't bring my camera, but I'll snap a few next time. There are ALOT of shops. Some offering only high end name brand stuff. some offering cheaper offerings. I was looking for Benro (China brand), so i skipped the shops with Manfrotto and Gitzo. Also I was looking for colored flash gel packs. They didn't have anything close to that. Oh well, maybe i'll just make my own. 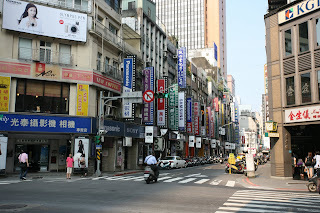 In order to get there, I had to walk through the Taipei Main station underground metro mall. It's Huge! Excellent place to walk around, eat, shop, or watch the high schoolers killing time breakdancing and other sorts of group dancing. How is the pricing there compares to the US? Yeah, you needs to wear shorts in Asia as the humidity is just too uncomfortable for wearing long pants. Pricing is slightly more expensive on Name Brand stuff, but then you save on tax and shipping. China/Taiwan made stuff is cheaper. Well most people here in Taiwan still wear jeans. Fashion over comfort i guess. Wow, you weren't kidding to call it "photography streets". All I see are signs for camera and chemical shops.